So, just how many sponge daubers have you misplaced or lost? We think it’s a lot! Here’s the perfect storage solution that you’ve been waiting for! 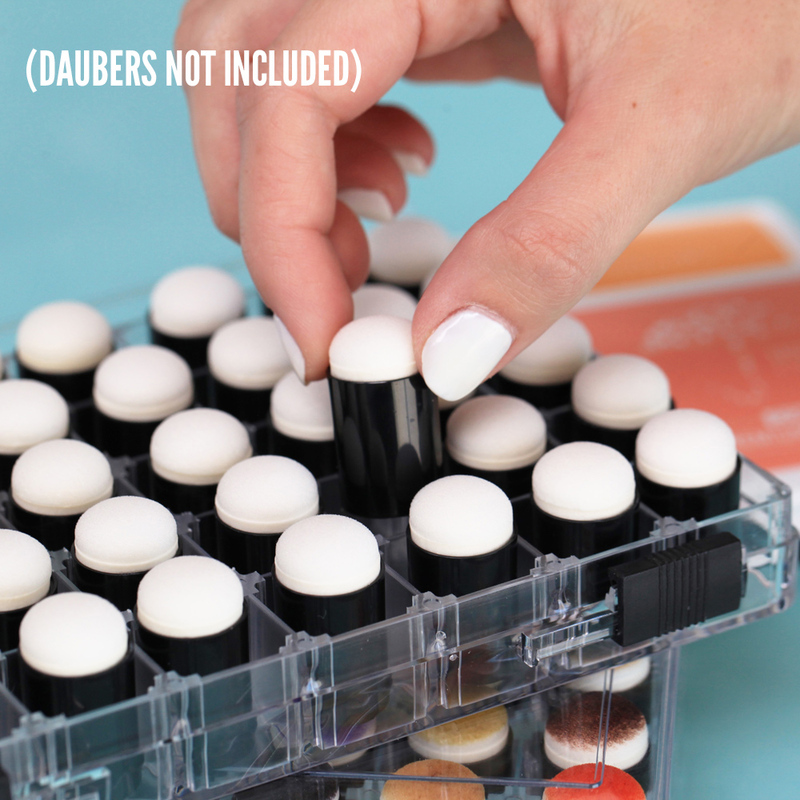 Our exclusive Sponge Dauber Storage Box is just what you need for your ever-expanding dauber collection. 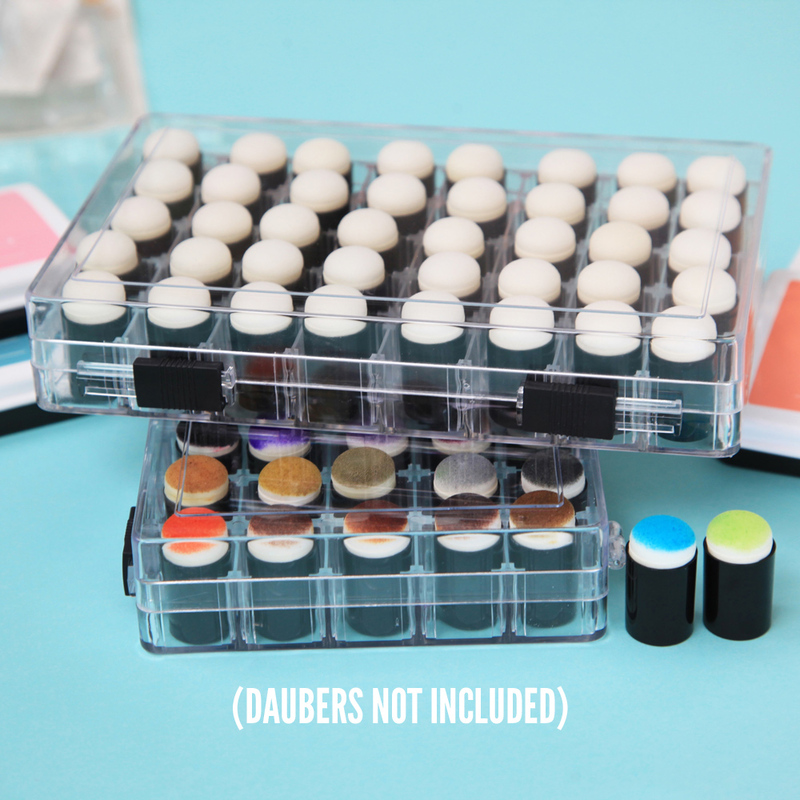 Now, instead of misplacing your favorite daubers, you can label and store them in this must-have storage box. The Answer to a Persistant Storage Problem! This is exactly what I needed! I really didn't have an efficient method of storing my fingertip daubers before, and, as a result, I've wasted and/or lost a lot of them. This box puts an end to the waste and gives me the storage solution that I've been looking for. I've already purchased four of these and will buy more in the future as my ink pad and chalk palette collections continue to expand. 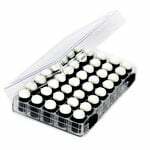 Now, instead of having them all over the place in unsightly sandwich bags, all of my sponge daubers are labeled and stored alphabetically and by medium (two boxes for ink and two for chalk). 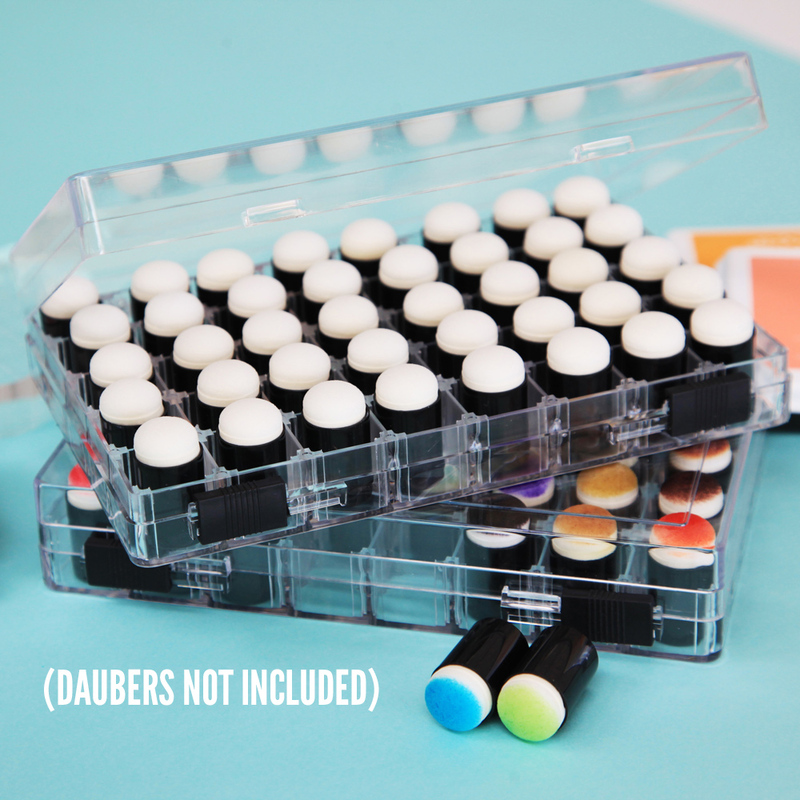 Everything is neat and clean, and the diminutive size of the box makes it very easy to take my daubers with me to crops. And it's impossible for the box to open by accident because there are two snug, fail-safe sliding locks on it! A great product and an excellent value! I ordered three of these...two arrived fine, one was cracked in shipping. I actually ordered one extra just because I had read about this problem on other reviews. I don't really need the third one, and figured I could give it as a gift or use it for portable storage, where it will likely get cracked later, anyway. 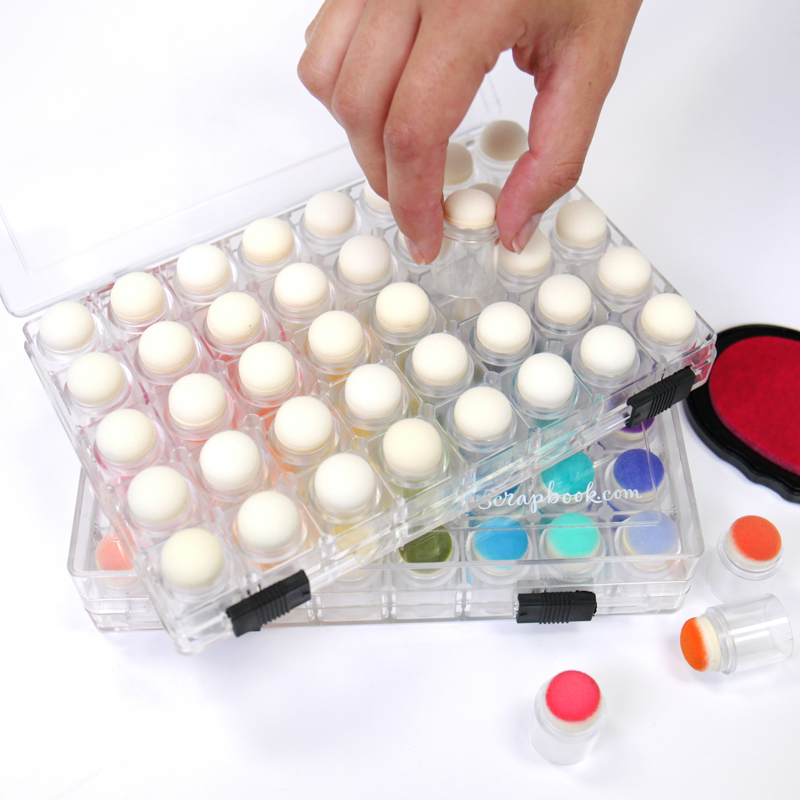 Other than being fragile, the box is great for organizing your daubers. It does the job it's intended to do, and it is pretty much exactly as pictured, so that's why I'm giving it 5 stars. One problem you might have is that the daubers are stored dirty side up, so you might get inky fingers pulling one out if it was used recently. Would have been better if it had a foam insert with holes where the daubers fit in snugly, with the sponge part down, and enough of the "handle" part showing enough to allow for labeling of the color name. This case exceeded my expectations in quality for the price I paid for it! 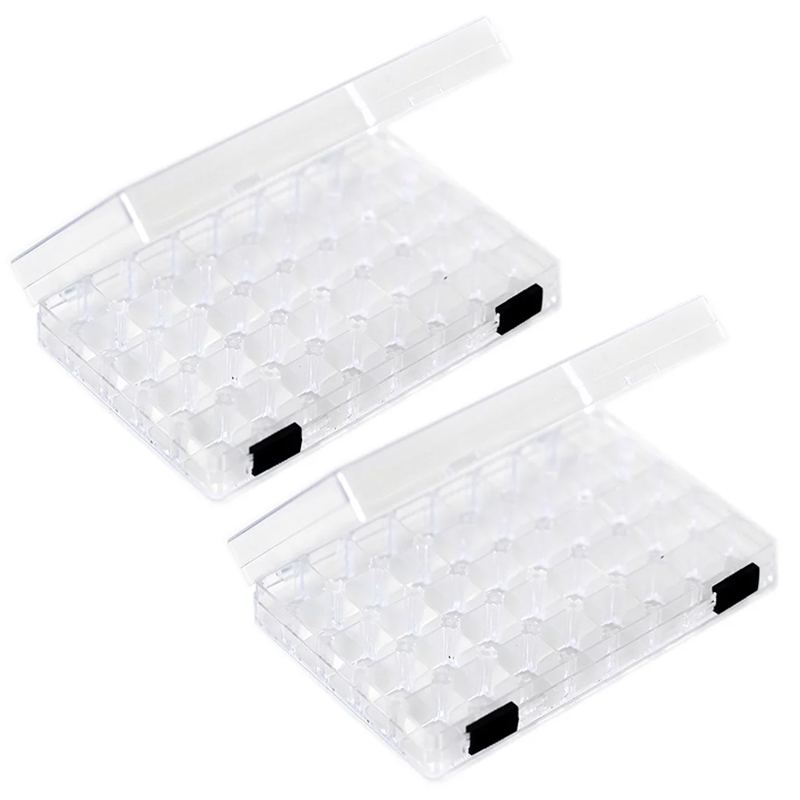 The acrylic is crystal clear, and thick, not flimsy like other cases I have seen at craft stores. The back hinges are well constructed, with a metal pin through the center for stability, and the front latches slide easily, but with a snug fit so the lid won't pop open. I started with an Altoid box as a tray and quickly ran out of space. I looked at Containers and all the hobby stores. No products out there were the right fit. 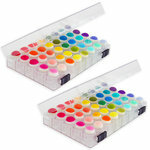 I remember seeing this box at a rubber stamp convention and was so glad to find it again and at a great sale price. I was shocked and very pleased to find them on my porch within 2 days of the order! The boxes arrived in excellent condition, the plastic was better quality than expected based on some of the reviews. Locking devices are a great feature and the download chart is very helpful. It's a nice compact size with enough space between each dauber and shallow enough to be able to retrieve the dauber easily. I love love this container and wished I ordered more even though I don't need them yet. Thank you! I edge/distress almost everything in my scrapbooks, so I go through a LOT of daubers. These cases are great! I've purchased several for myself and several more as gifts. I am particularly fond of the slide lock, which keeps the top of the case locked in case it gets knocked over - everything stays in place and the colors don't rub into each other. I used a template to stamp the dauber colors on a grid so I can quickly find the color I want. See sample at www.LaurasCropCircles.com (look under My Scrap Room). I LOVE sponge daubers. I've tried making some using foam cosmetic wedges and sections of PVC pipe, but nothing works as well as these sponge daubers. The clear case makes is sooooo easy to get just the right one when I need it. I use chalks and inks so I have plenty to use for both. I saw these at a unit meeting for a company I belong to (Close To My Heart) and loved it. 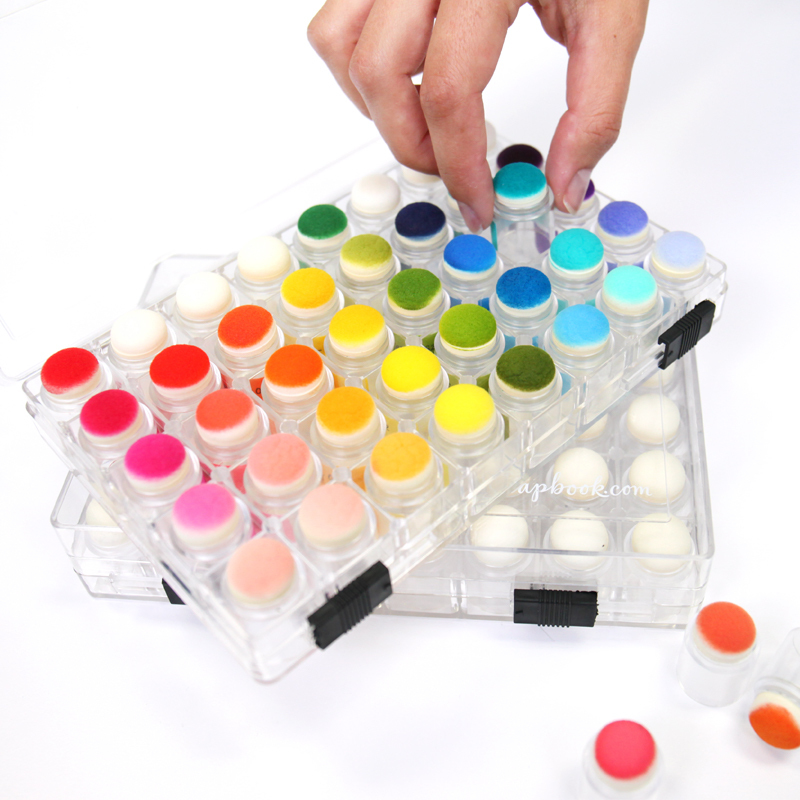 Another consultant had it and labeled each dauber with a different color so that we don't mess up our inks (we have a 60 color palette). I said to myself that I had to have one of these and ended up ordering one for me and one for my mother!!! I love them and it fits rights into my rolling tote. 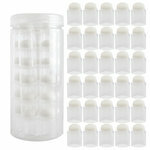 Couldn't have made a better product to store the daubers in! I love these boxes and purchased 2 more after I bought my first one. I am an avid "inker" and this product keeps my daubers in order and protects them and my other supplies from the ink remnants. 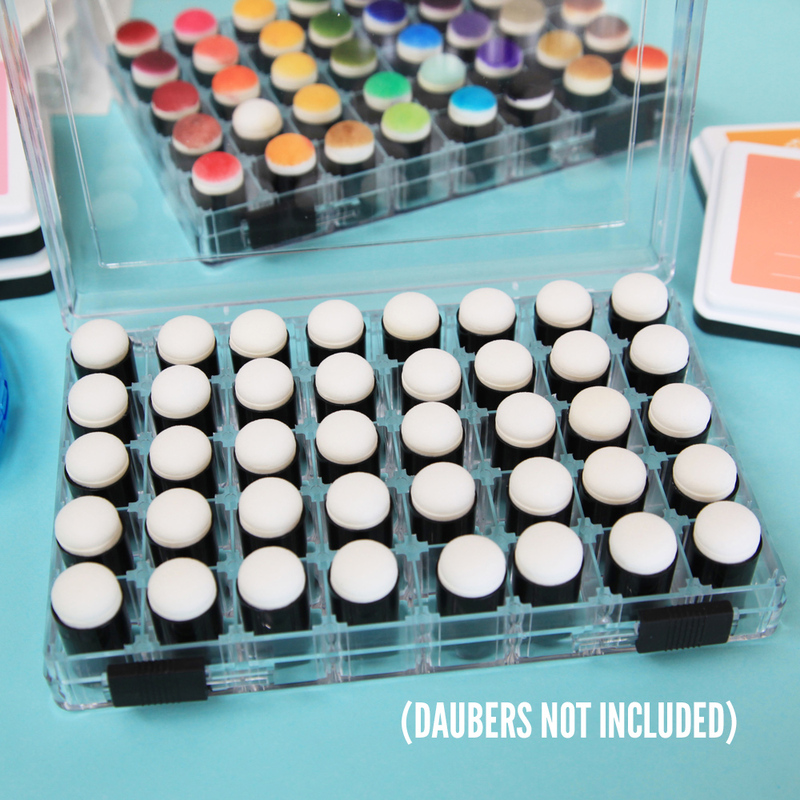 I can dedicate a dauber for each of my stamp pad and reinker colors to use repeatedly. Wonderful organizer. 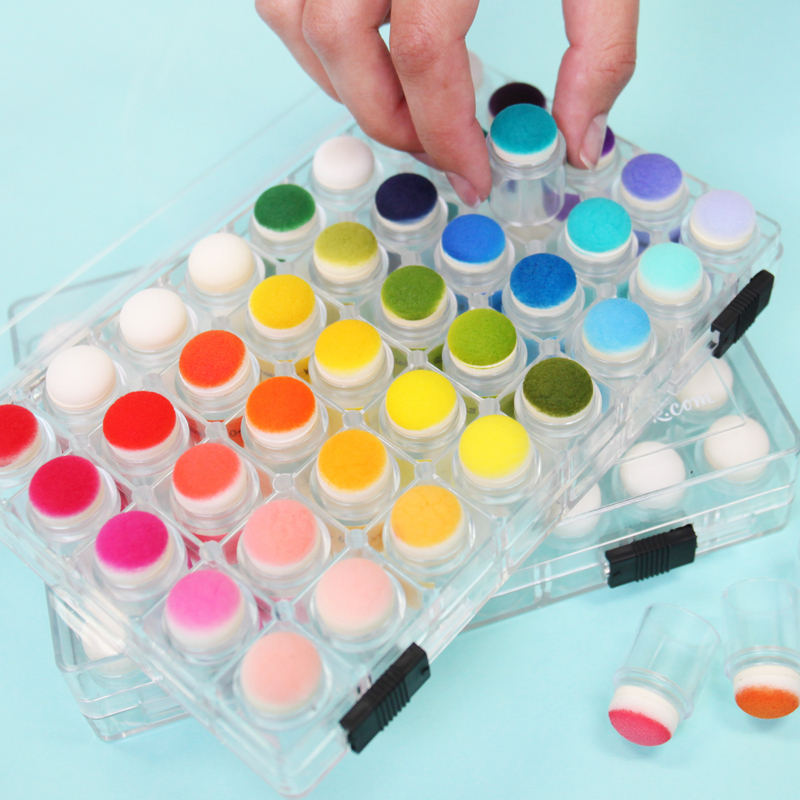 I finally have a way to see all of my sponge daubers that are being used and no longer waste time looking for a particular color! I am surprised no one thought of this sooner. 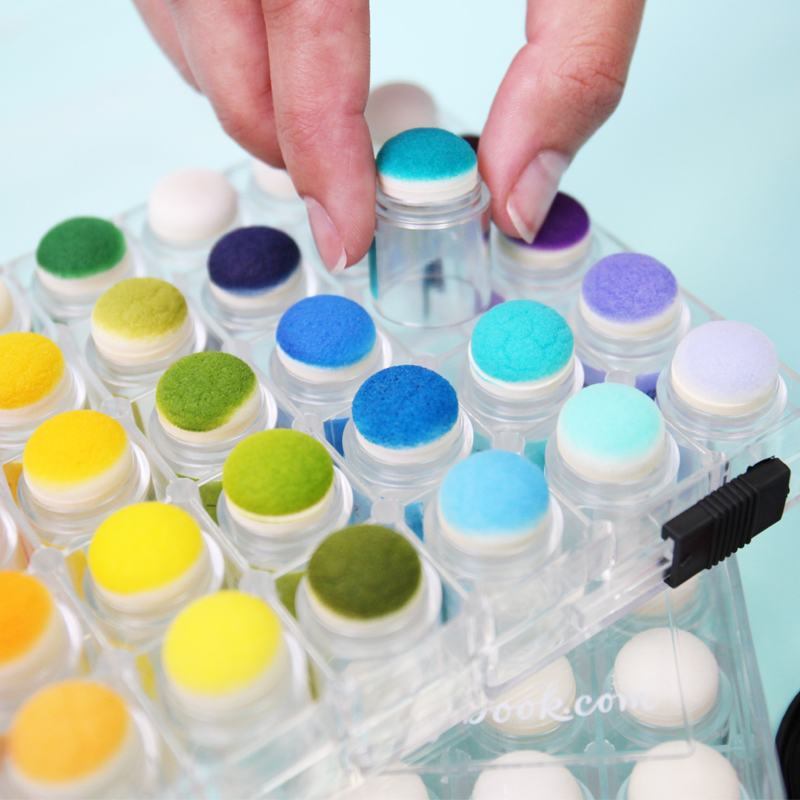 Perfect for anyone who uses a lot of sponge daubers in their craft/art projects. 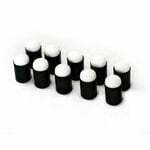 What are the dimensions (height, length & width) of the outside of the sponge dauber storage box when closed? By: Jillmf (07-Jan-19) Helpful Question? Yes | No Thank you! Report Inappropriate This question has been reported. Thank you! Hello! The dimensions of the storage box are 7.5” x 4.75” x 1.5”. I do hope this helps! By: sbc-julie (08-Jan-19) Helpful Answer? Yes | No Thank you! Report Inappropriate This Answer has been reported. Thank you! Are the the clear daubers you sell the same size as the black daubers? 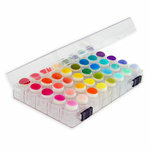 Do the clear daubers fit into this box? By: tbowlby (18-Sep-18) Helpful Question? Yes | No Thank you! Report Inappropriate This question has been reported. Thank you! The clear daubers are a little larger on the base. However, they fit perfectly in the Dauber Box. I hope this helps. By: juliechallis (19-Sep-18) Helpful Answer? Yes | No Thank you! Report Inappropriate This Answer has been reported. Thank you! I just received my storage box. How do you open it? I can't get it to open no matter how I slide the black closures By: User (26-Jan-17) Helpful Question? Yes | No Thank you! Report Inappropriate This question has been reported. Thank you! look at one side of box and see which frees the latch then do same on other side. I think it is both to the center but I'm at work and can't go look By: wildcat1971 (27-Jan-17) Helpful Answer? Yes | No Thank you! Report Inappropriate This Answer has been reported. Thank you! The other answer is correct. You slide black pieces toward the center. It is a little tight (at least mine was), but it did open. Hope this helps. By: calicolane (27-Jan-17) Helpful Answer? Yes | No Thank you! Report Inappropriate This Answer has been reported. Thank you! 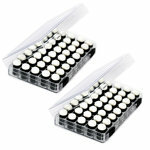 What is the difference between the sponge dauber storage box worth $29.99 on sale and the one that is $7.99? Thanks. By: poulsus (05-Feb-15) Helpful Question? Yes | No Thank you! Report Inappropriate This question has been reported. Thank you! The one on sale for $29.99 has 40 daubers with it and the one for $7.99 is just the box, no daubers. By: jillybean0827 (07-Feb-15) Helpful Answer? Yes | No Thank you! Report Inappropriate This Answer has been reported. Thank you! Could you please tell me the brand "name" of the sponge dauber? Thank you for your answer....Umbrella. Do you know how the Umbrella brand sponge dauber compares to the Tsukineko Sponge Dauber? Thank you. By: delgador (15-Oct-15) Helpful Question? Yes | No Thank you! Report Inappropriate This question has been reported. Thank you! Umbrella Crafts By: Amber Boren (15-Oct-15) Helpful Answer? Yes | No Thank you! Report Inappropriate This Answer has been reported. Thank you! I am interested in purchasing this for my Club members as a gift. I would need them by the first week of May. Do you have any timetable on how long they will be on back order? Thanks By: edwardsjv4 (10-Mar-15) Helpful Question? Yes | No Thank you! Report Inappropriate This question has been reported. Thank you! Hi, I'm not sure why I received this email but I really don't know how long this item will be on back order. I want to order a couple more for myself. They are great boxes for the small daubers. I'm guessing the product may be on back order the California shipping dock workers are on strike. It's been a problem for Stampin' Up! and I'm sure it's affecting other businesses as well. I hope these guys settle soon so things can get back to normal, well, as normal as possible. Good luck to you stampmagic1. I hope this storage case come in soon. You will be very happy with it when you get it. Take care and have a good day. Darlene By: dnanni (13-Mar-15) Helpful Answer? Yes | No Thank you! Report Inappropriate This Answer has been reported. Thank you! I cannot locate the link to download the sponge dauber storage chart that was mentioned in the how-to video. By: nanaemery (14-Feb-15) Helpful Question? Yes | No Thank you! Report Inappropriate This question has been reported. Thank you! I'm not sure what how-to video you are talking about but you can find a chart here: http://www.scrapbookneighborhood.com/downloads/dauberchart.pdf By: dlady (18-Feb-15) Helpful Answer? Yes | No Thank you! Report Inappropriate This Answer has been reported. Thank you!